This transitional charcoal brown 4 piece chic entertainment center from RC Wiley is a beautiful mix of modern and traditional style. With subtle distressing, decorative top molding, mullions on the glass from doors, parting rail, and bronze hardware, you end up with an attractive casual finish on this piece that will overhaul your entertainment area. With numerous adjustable shelves, you have the flexibility to organize your media devices and favorite display pieces to just your liking. Call the neighbors and plan a movie night, you will want to show off this beautiful new piece in our home. This transitional 66 inch charcoal brown TV stand from RC Wiley is a beautiful mix of modern and traditional style. With subtle distressing, mullions on the glass from doors, and bronze hardware, you have an attractive casual finish on a piece that is a perfect new home for your TV. With adjustable shelves, you have the flexibility to organize your media devices to just your liking. RC Willey. Your Home. Your Way. 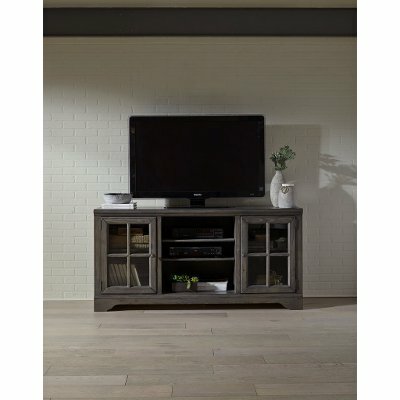 Accommodates TV's up to 75"
Charcoal Brown 4 Piece Chic Entertainment Center - Dilworth is rated 4.0 out of 5 by 2. Rated 4 out of 5 by FabGram Perfect Piece This has become the focal point for my step-down Great Room. It is large enough to store all of our components and cords are nicely out of sight. Excellent value. Rated 4 out of 5 by ManDarf Exactly what I needed I took a chance and ordered this after seeing it only online. I’m so glad that I did. It fits our living room perfectly. And the price is so reasonable. It did come with a crack in the top bridge, but one quick phone call and a replacement bridge was delivered a week later. Excellent customer service. We are very pleased with our experience with RC Willey and would definitely shop there again.